This how-to describes the process of creating self-signed certificate chains with the help of OPNsense which has all the tools available to do so. Chains give the possibility to verify certificates where a single one is nothing more than that, a single certificate. Look at the default install, one certificate is created for the webgui/dashboard. There is nothing wrong with that certificate if we use a real world CA, but we do not. We create our own chain so that one has no purpose once done. Should you even consider using self-signed certificate chains in this age of free available certificates? Self-signed certificate are just as secure as real world certificates. They are trustworthy chains, you know all parties. Intranets are often set up with these chains. Depending on what you do with your network/servers this is a good solution. Creating your own chain will give some insight in the process. Only use them if you are sure you can. Read about the concept in common there is a lot of info on the net. Use them for a web-facing server. They are only as trustworty as the person, company or organization signing it. Using these certificates can be a security risk if you are the one trusting them and not a CA. A chain will need at least a CA and certificate; an intermediate CA is not needed, but in case of a compromise the CA key would be compromised too. This document uses CN - Common Name should be read as: SAN - Subject Alternative Name and will be used if present. Please backup before you proceed. The first certificate to create is the CA. The only thing this CA does is sign the intermediate CA next in the line of trust. Self-signed root CA’s anchor trust chains, they are vital and OpenSSL requires them for your chain of trust. Some entries in the form are showed here. Click on the thumbnail for a picture. When you are done save the form, the CA is now generated. Always use valid email addresses for your certificates. Bogus addresses can pose a security risk – and not only for certificates. Time to create the second CA, which is an intermediate CA. This certificate will be signed by the root CA we just created. In return it will sign the sever certificate for OPNsense. Have a look at the form, create an intermediate CA and save it. The thirth certificate will be a server certificate signed by the intermediate CA we just created. This will also be the last one we create for this chain. 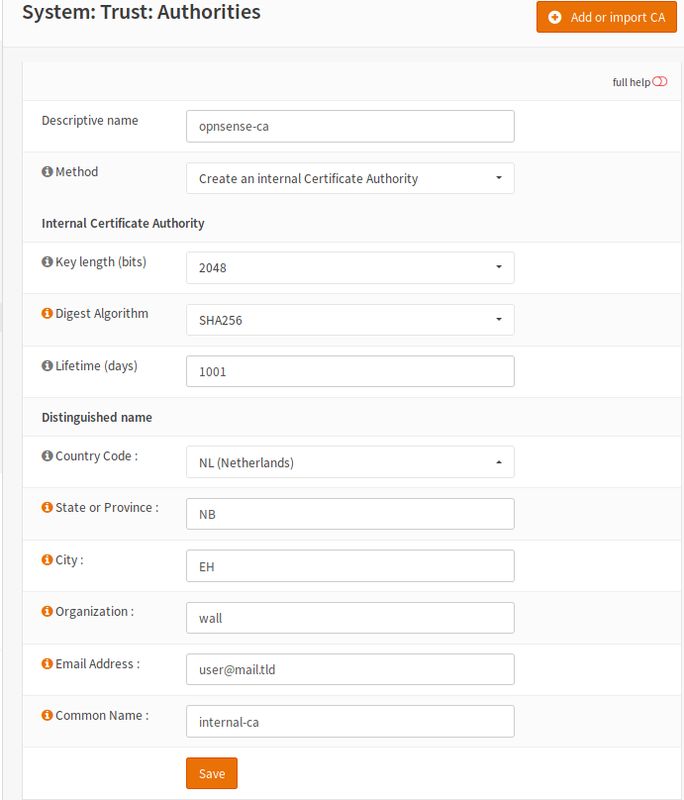 Have a look at the next form and notice the common name, create a server certificate and save it. Set SSL-Certificate to use the new server certificate. Open your browser and open the OPNsense/webgui page. You should be presented with a certificate that is verified by your intermediate CA. The local chain for Nextcloud server so we can use OPNsense backup to Nextcloud. Go ahead and create a new chain CA – intermediate CA – server cert.. The certicate store on your OPNsense ca-root-nss is not aware of the CA we are generating that is why we need to add this CA to the store. The sum of the file does not match the sum saved in the system after adding the CA. Do a health check before you add the CA. If the check was okay add the CA to the store. Go to Trust/Authorities create a new CA for Nextcloud and save it. OPNsense needs to be made aware of the Nextcloud chain we are creating. Download the CA.crt and upload it back to OPNsense in a secure way. Install the CA.crt with cat, you cannot just copy it to the store because it is a single file. 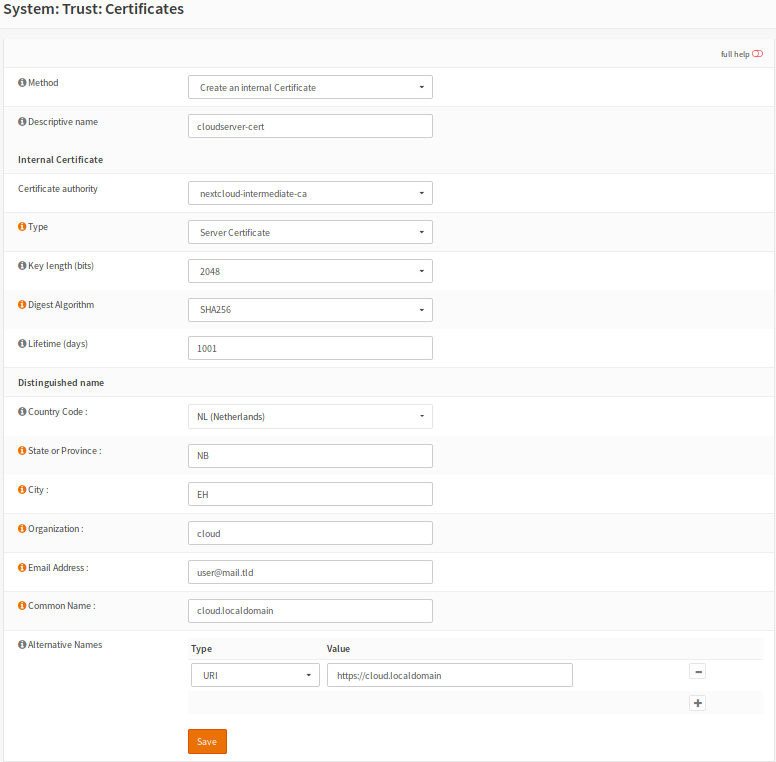 If ca_root_nss is updated your certificate is removed and needs to be added overnew. If you created a sum.txt you need to create it again, see previous Tip. Next in line will be the intermediate CA which will be signed by the root CA we did just create. 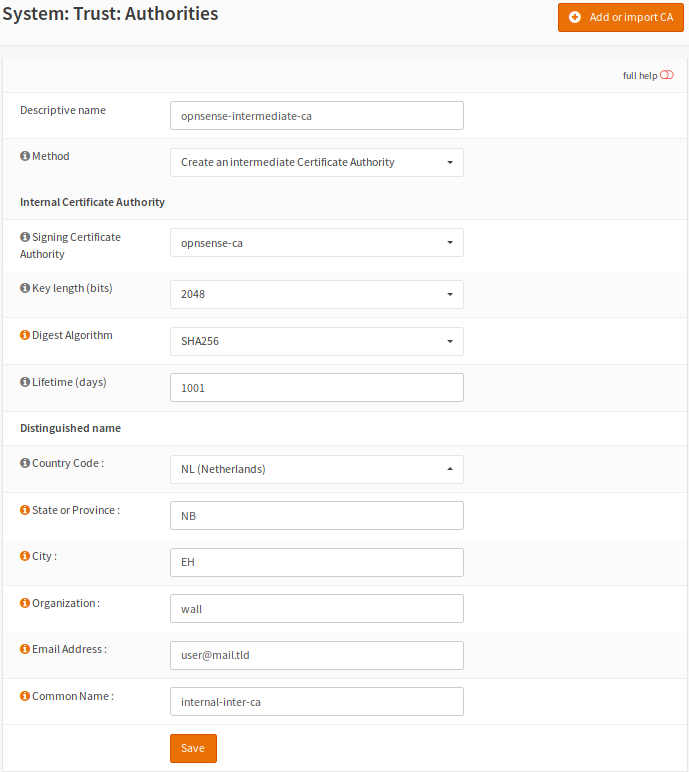 This intermediate CA will sign the Nextcloud server certificate. Go to Trust/Authorities and create an intermediate CA. 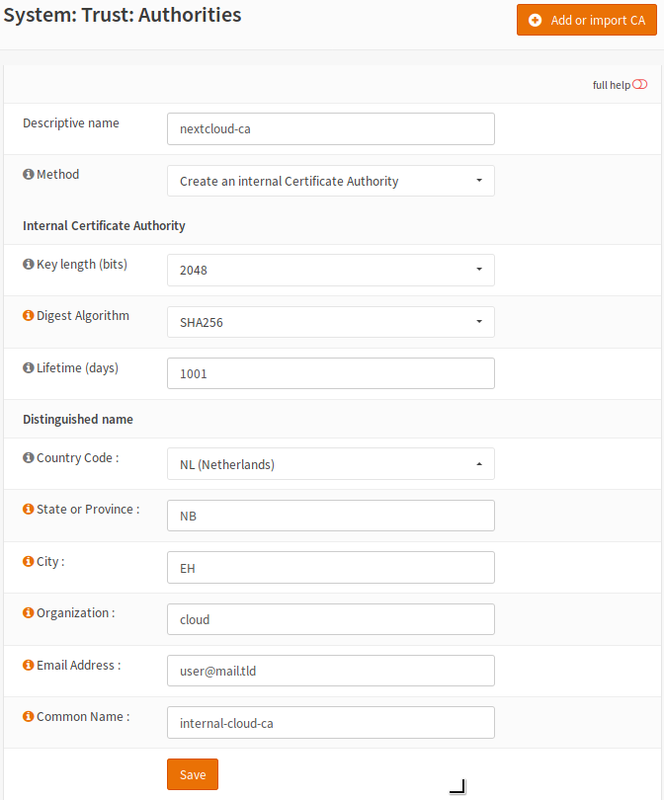 Import the intermediate CA into the certificate store from your browser. 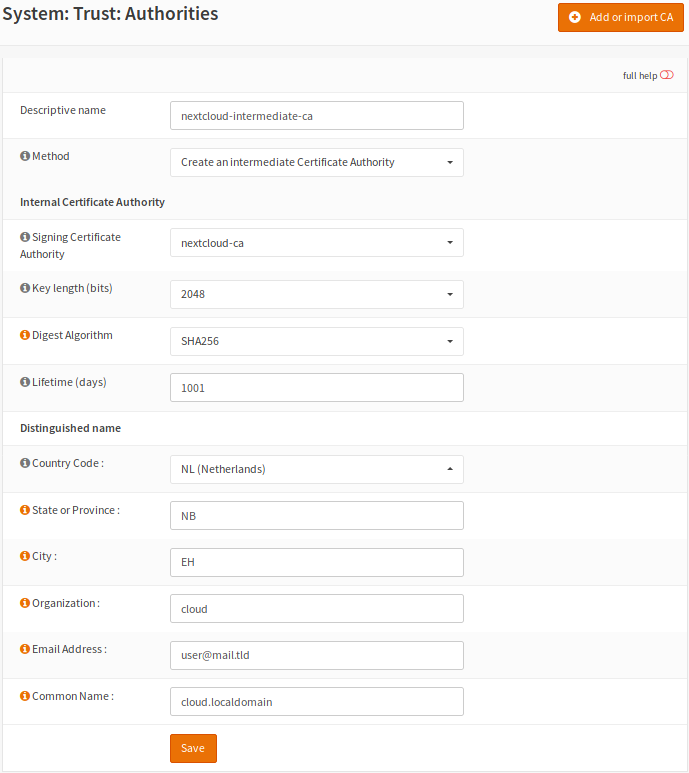 Next we create the server certificate for the Nextcloud server. Go to Trust/Certificates create a server certificate. We need to install this certificate and key to our Nextcloud server, two ways are shown here. Upload the *.p12 archive to your Nextcloud server in a safe way. Extact the archive into a single PEM file and create a certificate and a key. Upload the *.p12 archive to your Nextcloud server, in a safe way..
Extact the archive into a single PEM file and create a certificate. /etc/ssl/localcerts will be alright for the certificate or choose your own prefered location. If the key was extracted separatly, /etc/ssl/private would be a good choice. Be sure to set sane permissions on the private directory, 700 would do it. You could set umask too (see) man umask - on your Linux box. Edit the webserver config to use the certificate and key or single key-cert file. Sane permissions, 400 read only owner is sufficent. You should now be able to backup to nextcloud and have a verified page. After setting up the Nextcloud backup everything should work. Issuer unknown because of an incomplete chain: the CA (issuer!) is missing. The Nextcloud CA was not installed to OPNsense certificate store ca-root-nss. This following chain we create is basically the same as the previous chain for Nextcloud server. If needed use the pictures from the Nextcloud chain. Create a chain for your server CA - intermediate CA - server cert. Upload it to the server and extract the archive. Some sane permissions on them. Set the server to use the installed certificate. Install it in your browser. Head to the webservers page and be presented with a verified certificate.